As autumn closes in, it’s natural for us to think that the garden has served its purpose. We stop mowing our lawns and trimming our hedges and, as the leaves start to fall, we begin to think that winter is on its way. But this is far from the reality—especially this year, thanks to welcome forecasts that we are going to be enjoying an Indian summer. 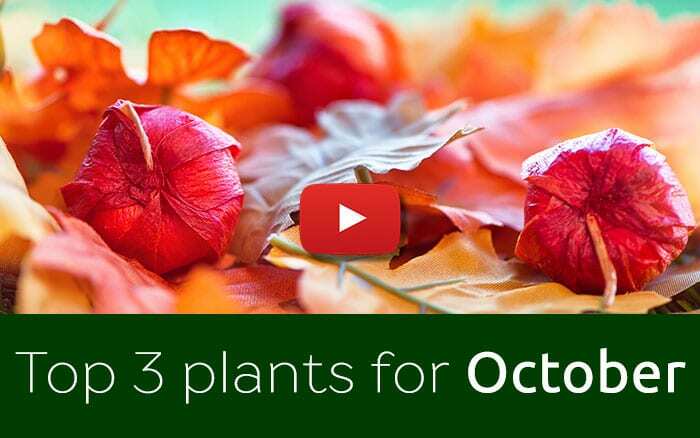 Now is a better time than ever to take a look at your garden and employ a few tricks to extend the season right into winter. 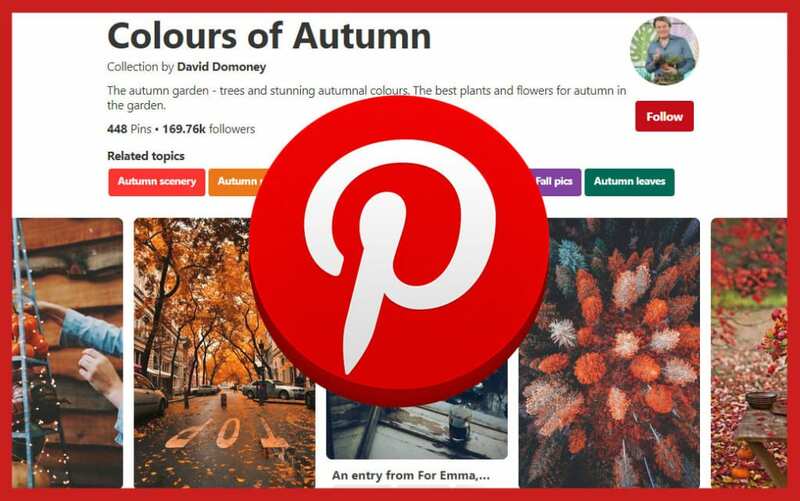 This will help you to squeeze every last drop of pleasure out of the autumn sunshine and to take in the glory of the outdoors rather than shutting nature out quite so soon. A lot of people have stopped cutting the lawns and, as leaves begin to collect, it gives off that autumnal feel. However, raking up the leaves and giving the lawn a final trim will make your garden look smart; providing a welcome throw-back to luscious summer lawns. It’s also a good time to feed the lawn, especially after the dry summer we’ve had. Putting in a good deal of autumn lawn food works well in reinforcing and supporting the grass’s roots, which will re-initiate early next spring. Also, if you keep down the weeds and trim the hedges this will keep up appearances and benefit you later on in autumn. To give your garden a lift, add some late colour to borders and containers. Most summer bedding plants are starting to finish flowering around now, so removing and replacing them with autumn and winter bedding will give your garden a real boost. 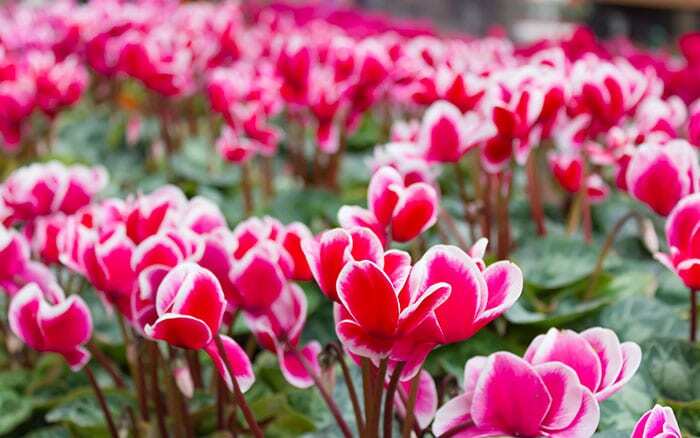 Choose violas, pansies, Polyanthus and Cyclamen for a fantastic pop of colour over the coming months. Varieties like trailing ivy and Hebe elliptica provide intriguing foliage throughout the colder months. 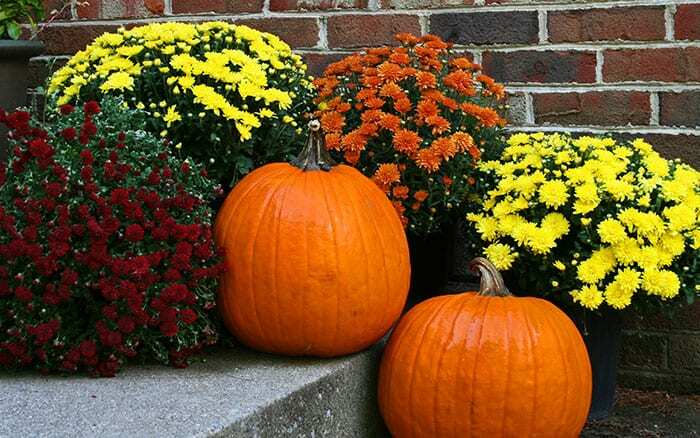 The big champions of this month, however, are the Chrysanthemums and winter-flowering heathers. Chrysanthemums come in a variety of beautiful autumnal hues and flower well into the winter. 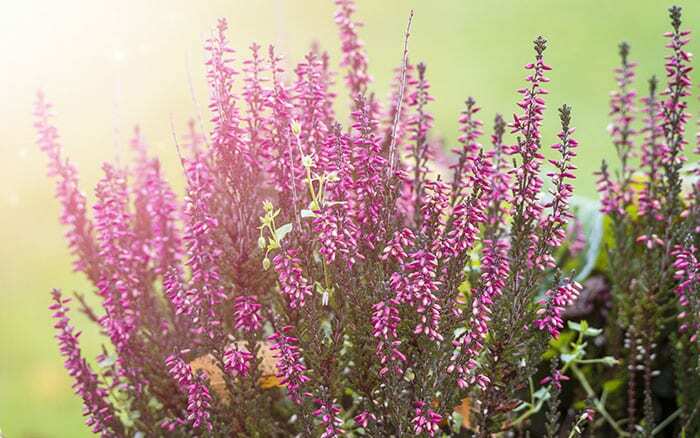 Similarly, heathers like Erica carnea, which are known for their amazing variety of pinks and whites. 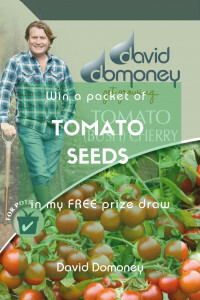 This will provide beautiful colours throughout autumn and winter. 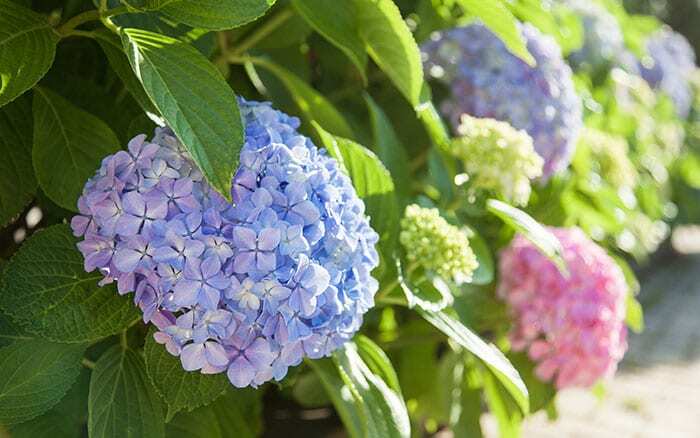 Brilliant autumn-flowering shrubs include late-flowering Hydrangeas and Hebes. There are lots of different colours and varieties to choose from and Hebes are a fantastic nectar source for bees and other pollinators as well. Skimmia japonica ‘Rubella’ is another fantastic option. At first glance it appears to have clusters of small red flowers but these are actually buds that will open into delicate white flowers come spring, so you can enjoy changing colour from these delightful plants throughout the colder months. 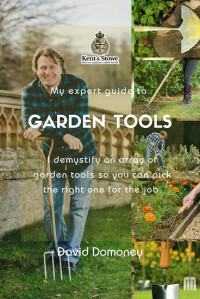 Don’t forget, this is also the time for planting fruit trees and bushes, like apple and pear trees, but also redcurrant, gooseberry, raspberry and blueberry bushes. 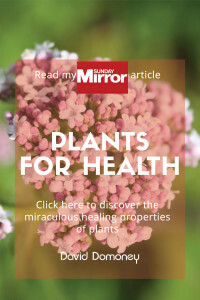 Plant them separately or mix them in borders amongst shrubs as they make nice ornamental plants as well producing delicious fruit come summer. Our Indian summer means that we are still due some really sunny days, but this doesn’t prevent the onset of cooler evenings. Make evenings more comfortable with the magic of outdoor heating—opt for an outdoor electric or gas heater to cosy up beside or burn natural fuels in on-trend fire pits. 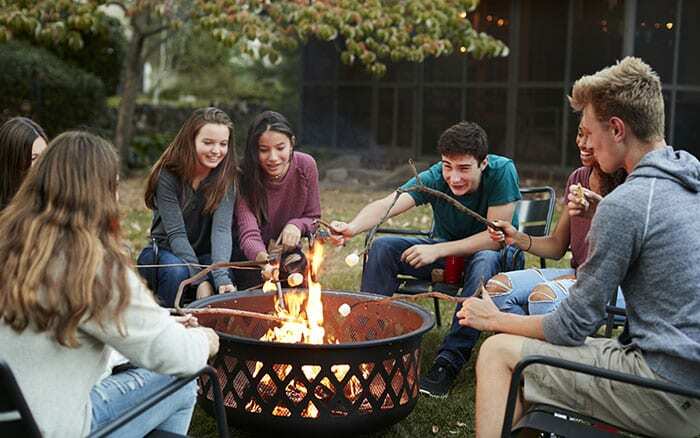 Fire pits work particularly well with logs or BBQ briquettes and enable you not only to keep warm, but also to enjoy watching the mesmerising movement of the flickering flames. There is nothing better than coming together with close friends or family and chatting around a warm fire on a cool autumn evening. Plus, if it comes with a cooking arm, you can rustle-up a couple of decent rib-eye steaks at the same time! 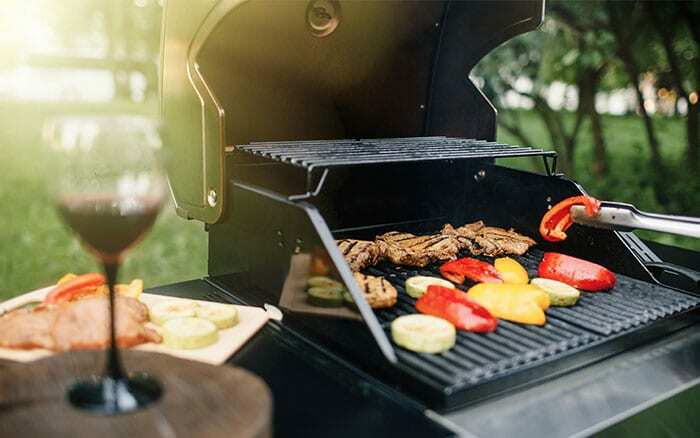 Talking of cooking in the garden, don’t resign your trusty barbeque to the shed just yet either—get it sizzling for Halloween parties and fireworks night gatherings to create great atmosphere on those cooler, darker nights. You might even think about investing in a garden hot tub. What could be better than climbing into a beautifully warm tub in your garden while breathing in the blissfully cool and refreshing night air? I like open-air hot tubs that aren’t covered by gazebos or other shelters so that I can gaze up at the stars on a clear, cool night. It’s heaven. under attack by animals such as squirrels. 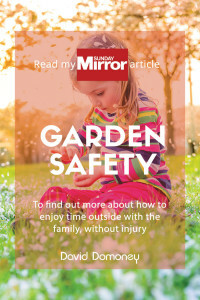 Get your kids exercising outdoors with garden games like hide and seek, croquet, skittles, stuck in the mud and football. It’s cheaper, easier and much better for their health than bundling them off to the cinema! 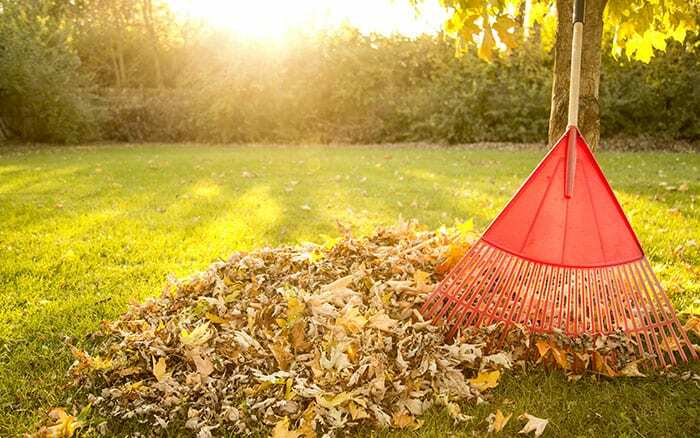 Use these handy tips to spend some time enjoying the last rays of autumn sunshine and enjoy the many benefits of being in the great outdoors for a little while longer this year. My Acer tree has coral spot. What can I do about it? Coral spot is a fungal disease caused by spores spreading from discarded dead branches to living wood. 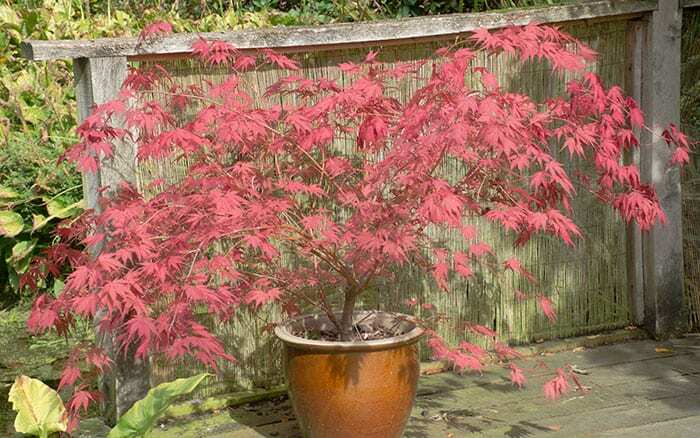 To get rid of it, clear any dead branches to prevent spores spreading. Then, prune away infected branches, by cutting through the swelling at the base of the branch (this area will heal faster). If die-back continues, repeat pruning and remove dead wood. Coral spot often infects unhealthy trees, so look for other issues that might be affecting your plant. How can I protect my outdoor plants from frost? Being prepared for frost is really important at this time of year as frosts can strike any time from now onwards, depending on where you live. Applying mulch around plants and shrubs can help to prevent top soil from freezing. 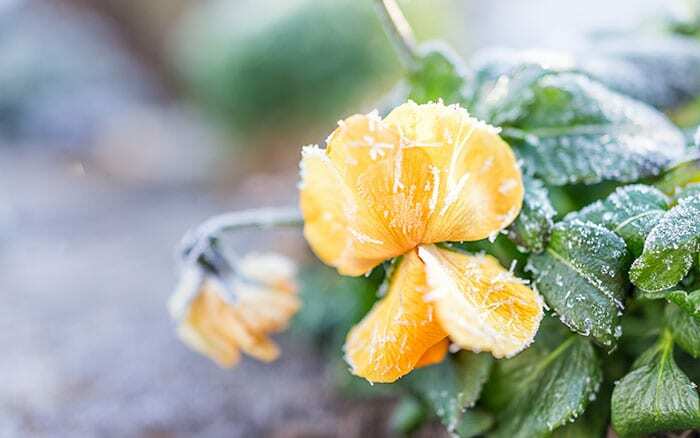 Covering plants overnight with an old blanket or with frost fleece from the garden centre will also help to prevent freezing. With really vulnerable container plants, like Dahlias, its best to bring them indoors overnight.